Tomi, originally uploaded by red R.
A beautiful red squirrel photo from red R Flickr user. Gorgeous shot! 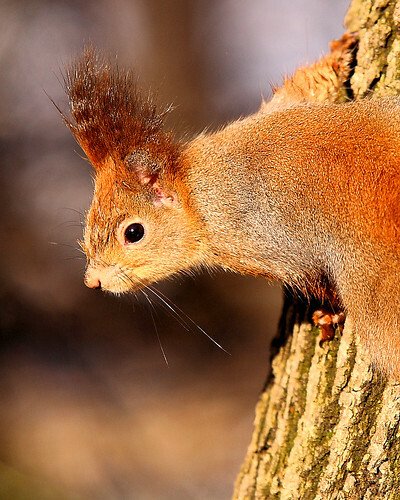 Red squirrels normally set up their nests far away from humans and other predators. But an oddball squirrel in Pennsylvania decided to make use of a Ford Explorer while the owners were away, reports the Centre Daily newspaper. Click the link above to see the amazing photo of the complicated nest. A column in the Canton, Illinois Daily Ledger illustrates how smart squirrels are. My guess is the writer encountered a red squirrel, a species that is notoriously entertaining AND territorial, aggressive and noisy. Not to mention totally cute.